Villa ART ( for 8 persons ) 190 m²: This luxuriously equipped 4 star rental apartment, the villa has only one rental apartment so the entire house is only available to the guests of this apartment. It is located in the quiet part of Makarska, where in the morning you will be the bird twitter instead of the noise of the car. Villa ART is situated on a slope, facing the sea and always sunny, only 500 m away from the city center and all the attractions and 600 m from the town beach and 200 m from the shops and restaurants. The villa has 4 double bedrooms, living room, kitchen with dining room, 3 bathrooms / wc, one separate wc, large terrace overlooking the sea. Vila Art also has a large garden with 2 pools, a bigger pool 8 x 4 m, a depth of 1.5 m + a 3 meter-long infant pool, a massage Jacuzzi, a large garden with lawn, orchards, vegetables and Mediterranean herbs. In the garden there is also a barbeque with grill, kitchen and a massive wooden table for 8 to 10 people. The house is completely fenced and inside the yard there is a parking lot for 3-4 cars. From the terrace of the villa there is a beautiful panoramic view of the sea and islands, Brac and Hvar and on the other side is a view of the mountain Biokovo. If you choose to spend your vacation in Croatia and Makarska, we hope you will choose ours and your "Villa ART" We look forward to your arrival. Family Stojadinović. LIVING ROOM: 40 m², leather sofa + chair + satellite TV + WiFi - internet + air conditioning + open kitchen with a dining + table and chairs + Exit to the balcony from the living room with panoramic sea views. KITCHEN: Open kitchen with dining area, stove with oven (4 hotplates), microwave, refrigerator with freezer, electric kettle, dish washer + storage + cleaners. BEDROOM 1: Double bedroom 14 m² with double bed 200x180 cm + wardrobe + air conditioning. BEDROOM 2: Double bedroom 22 m² with double bed 200x180 cm + wardrobe + air conditioning + bathroom, shower + wc + hairdryer + towels + toiletries and a balcony overlooking the sea and swimming pool. BEDROOM 3: Double bedroom 22 m² with double bed 200x180 cm + wardrobe + air conditioning + bathroom, shower + wc + hairdryer + towels + toiletries and a balcony overlooking the pool, garden and the sea. BEDROOM 4: Double bedroom 11 m² (entrance from the room No.3) + double bed 200x160 cm + wardrobe + view of the mountain. BATHROOM: 9 m², shower cabin + bath + bidet + wc + washing machine + hairdryer + towels + toiletries. TOILET: Separate WC + towels + toiletries..
BALCONY: 20 m², table and chairs for 8 people, panoramic Sea view. GARDEN: 500 m² with pool + garden furniture + beach chairs + umbrella + outdoor shower + grill. SUMMER KITCHEN: Covered arbor 30 m², big massive wooden table and benches, barbecue, sink, refrigerator, dish washer, electric kettle, cutlery and drinking and cooling fans. SWIMMING POOL: Villa Art has two swimming pools, a larger pool of the elliptical shape of 8x4 m and depth 1.5 m + a small round pool combination of children's pools and Jacuzzis diameter of 3 m and a depth of 90 cm. See more photos of the Villa ART ► "Photo Album"
THE PRICE INCLUDES: Tourist tax, Air conditioning, Internet, Bed linen, Towels, Toiletries, Cleaning products, Parking,and Final cleaning. (The guest is obliged to take care of the facility, before leaving the accommodation the guest must collect the trash, wash the dishes and leave the accommodation in an idle condition if the guest leaves the accommodation in a very unlucky condition requiring additional cleaning people the guest will be charged for cleaning). DEPOSIT: The guest is required upon arrival at the owner of the apartments to deposit 400 € which will be returned if no damage to the accommodation unit. Guest reviews are written by our customers after their stay at Villa Art. , houses for rent, as well as private apartments in Croatia, are part of our tourist offer. They provide a pleasant stay in private accommodation for many foreign tourists along the beautiful beaches of the Mediterranean and this Croatian region called Dalmatia. Holiday houses in the villages at the foot of Mt Biokovo, often renovated in Dalmatian style, offers the atmosphere of some ancient time, but also luxurious and comfortable accommodation for you, your family and friends. Today, the popular trend of building family houses and villas with pool in Croatia with modern architectural features, of course harmoniously blended into the environment, extend the offer for a little choosy clientele for their vacation. Tourism in Croatia, especially in this area with its hotels, private homes, holiday houses, apartments, follows global trends. Our recommendation for vacation is not limited only to families with children, but has rich offer for young people, as well as many tourist facilities designed for adrenaline addicts and adventurers. is a travel agency based in Makarska, which has been carefully built offer for private accommodation in Croatia, private houses and villas with pool in Croatia, especially in Makarska Riviera. Thousands of guests who have booked vacation through our website and pleasure in their comments prove that our tourist offer deserves your attention and trust. For holidays for families with children we offer modern apartments near beach, overlooking the sea. Standard equipment of the apartments are TV and air conditioning, but also wi-fi internet connection. For guests looking for something a favourable offer for their holidays we have prepared a studio apartments in attractive locations at very reasonable prices. Holiday houses and villas with pool in Croatia, especially Dalmatia and Makarska Riviera region, are part of our offer for a little choosy guests, and most were built in Dalmatian style. Content and equipment in villas guarantee you pleasant and comfortable vacation. 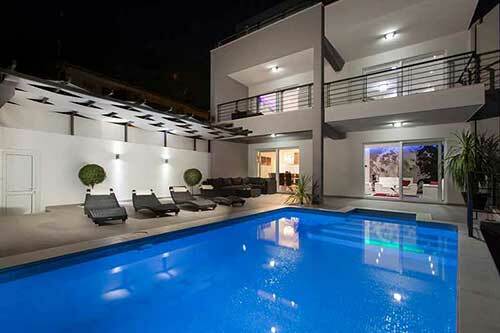 We also offer a luxury villa with swimming pool for some wealthy guests where they will not miss anything. With superior interior equipment, kitchen and bathroom, many villas have their own wine cellars, saunas and gym-hall. All villas with pool have own garden and additional facilities such as barbecues, garden furniture, wine cellars, etc. Private accommodation in Croatia, villas with pool and holiday houses in Dalmatia, especially Makarska Riviera, each year sees new challenges. Our experience and the experience of our landlords adapt our offer in order to better identify and meet your desires and enjoyable and relaxing vacation. Part of Dalmatia called Makarska Riviera, the area is of outstanding natural beauty and rich historical heritage. The beginnings of tourism date back to the beginning of the last century, that is over a hundred years. Today, Makarska, as well as surrounding villages Brela, Bast, Baska Voda, Tucepi, Podgora, Drvenik, Zaostrog and Gradac, is favourite destination for almost a million tourists from around the world annually. In some places, the slopes of mountain Biokovo meet Adriatic Sea and create a coastal strip with many small and larger bays, and a number of beautiful pebble beaches known around the world. Bays as well as slopes of Mt. Biokovo are frames for many smaller settlements and hamlets such as Bast, Promajna, Bratuš, Krvavica, Veliko Brdo, Makar, Kotišina, Drašnice, Igrane, Živogošće, Zaostrog, Podaca, Brist. Beautiful blue-clear Adriatic Sea is nowhere so saturated with colours like here. The very first contact with this area leaves breathless visitors from all over the world so very quickly. They realize why Makarska Riviera holds the title Pearl of the Adriatic. This area, without a dirty industry, today emphasizes cleanliness and preserved nature as a unique feature. The sense for the value of natural beauty is also evident in the proclamation of mountain Biokovo as a nature park. Biokovo Nature Park is a protected area of impressive geological, natural and cultural attractions. A lot of tourists daily visit mountain peaks on foot, organized excursions or cycling tours. Makarska and Makarska Riviera have an advantage over many tourist destinations in Croatia. With its location, with a rich gastronomic and tourist offer, restaurants, disco bars, gives also possibility for various excursions to suit every taste. One day trips to Dubrovnik, Split, Sibenik, Zadar, Mostar, Medjugorje, and boat trips to the islands of Hvar, Brac and Korcula, allow many relaxed holiday and additional experience of the rich cultural and natural heritage.